From antiquated systems designed to lift water to the complex modern components on gigantic cranes, pulleys are one of the most useful tools in existence. You might not notice them, but they're likely scattered throughout your home. 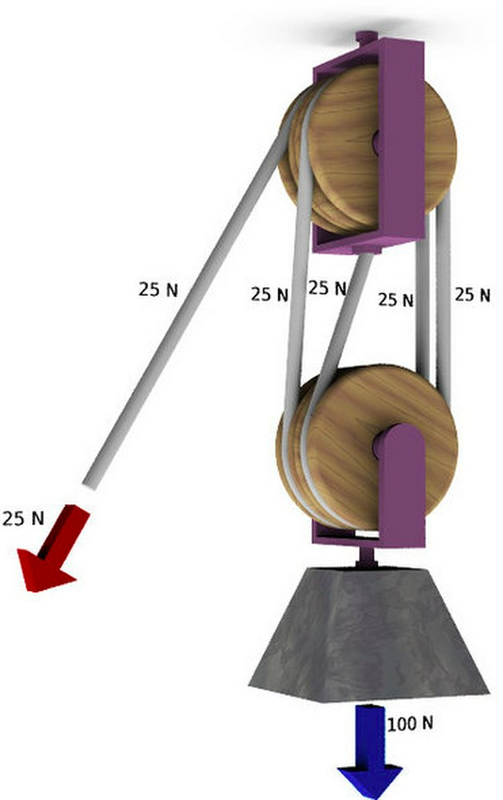 A compound pulley with 4 wheels will move objects using 25 percent of the force. A pulley is a form of non-motorized simple machine—one of six simple machines that have been understood and used for thousands of years. Pulleys use a combination of one or more wheels with axles, inside a block or housing. The wheels are operated by a rope, cord or chain. Thousands of years ago, the pulley's primary use was to lift very heavy objects. Contemporary pulleys are often smaller, designed for use in everyday applications. Pulleys differ in makeup and type, but the concept remains the same—to offer lifting assistance by multiplying force or changing the direction of force. Some pulleys offer a mechanical advantage, making it possible to move loads using less force, while others do not. Single-wheel pulleys: Also called simple pulleys, these simple machines employ a single rope, looped over a single wheel. Single-wheel pulleys reverse the direction of the force and offer no mechanical advantage. It requires 100 pounds of force to lift a 100-pound weight with a single-wheel pulley. However, a single-wheel simple pully does change the direction of the force, which can be quite a large advantage. Lifting a 100-pound weight by applying downward force is considerably easier the hoisting it straight up. Two-wheel pulleys: This is one form of compound pulley. In this system, the rope is looped through two wheels, reducing the force needed for lift the load in half—it requires only 50 pounds of force to lift 100 pounds with a two-wheel pulley. Multiwheel pulleys: This is another form of compound pulley. The majority of pulleys around the house have one or two wheels. More complicated pulleys might run the rope through three or more wheels. Each additional wheel increases the mechanical advantage. For example, lifting a 100-pound object with a four-wheel pulley system reduces the lifting force to 25 pounds. Two-wheel compound pulleys reduce the lifting force, but they require you to pull the rope twice as far as single-wheel pulleys. For example, lifting a 100-pound object 12 inches with a single-wheel pulley requires you to pull the rope exactly 12 inches. Lifting a 100-pound object 12 inches with a two-wheel pulley requires you to pull the rope 24 inches. This simple math also extends to compound pulleys with three, four, or more wheels. A four-wheel pulley, for example, requires you move the rope four times as far as is required for a single wheel pulley. You may think that because they are such simple mechanical machines, pulleys are not that common around a modern home, but this is not at all true. Some examples. Curtains and blinds: Curtains are one of the most common applications of pulleys in your home. Pulleys move curtains back and forth, and they lift and lower window blinds. Depending on their design, curtains may employ two-wheel pulleys or a combination of single- and dual-wheel pulleys. Fitness: With all the pulley shapes, sizes and types used, exercise equipment might seem to be nothing but pulleys. Single, double, triple, or quadruple wheels are used to lift, stretch and pull weights from every direction. Clotheslines: These backyard fixtures benefit from having pulleys on both ends. Walking back and forth to the clothes basket is unnecessary. Stand at one end, pull the rope, remove the clothes and put another item in the basket. Extension ladders: Full-extension ladders have pulleys inside the framework that allow for the extension of the ladder. Without pulleys, extension ladders would be difficult to operate, at best. Projection screens: Modern technology, too, depends on pulleys. Home theaters use pulleys to lift and lower large projection screens. Fall protection: Safety harness gear used to protect climbers against slips and falls sometimes includes pulleys. They allow more mobility than fixed harnesses. Garage doors: Automatic garage door openers use pulleys to lift and lower the door. Manual garage doors can employ pulleys that enable you to lift heavy doors with little effort. Flagpole: If you're patriotic, you might have a flagpole in front of your house. The pulley is a vital part of lowering and raising the flag. Garage storage: Use pulleys in the garage to lift and store items such as bicycles near the ceiling, out of the way.